We've watched the inbound marketing experts, HubSpot, develop their strategies, tools and approach for around five years now. Although they never cease to amaze us, the decision to move away from their funnel-based model to a new design is a big move. Agencies, followers and companies of all sizes across the world have adopted the linear approaches of the buyer's journey funnel and inbound marketing methodology with gusto - so to turn around and say actually there's something better we should be using is impressive. "A heavy revolving wheel in a machine which is used to increase the machine's momentum and thereby provide greater stability or a reserve of available power." It's somewhat funny for North East businesses that HubSpot has opted for a flywheel approach, after all, James Watt contributed to the development of the flywheel in the steam engine during the Industrial Revolution. It goes without saying that the whole North East region was the powerhouse for the country during the Industrial Revolution, with former coalfields, steelworks and docks all a clear sign today in our biggest city, Newcastle and major town, Middlesbrough, as well as places in-between, of our significance in this period of history 200 years ago. Of course, we shouldn't just adopt the flywheel because it played a huge part in our local history, we should adopt it because it makes so much sense to do so! Funnels focus on lots of momentum to begin with and allowing this energy to filter down to the end result, where they, well, stop dead. Of course, HubSpot's linear approach didn't encourage such a result, but it did visually appear in that way, even though there's the "Delight" stage which suggests you should keep enticing customers to stay a part of your brand and refer new customers to you, ultimately, it looked like a 'stop sign'. 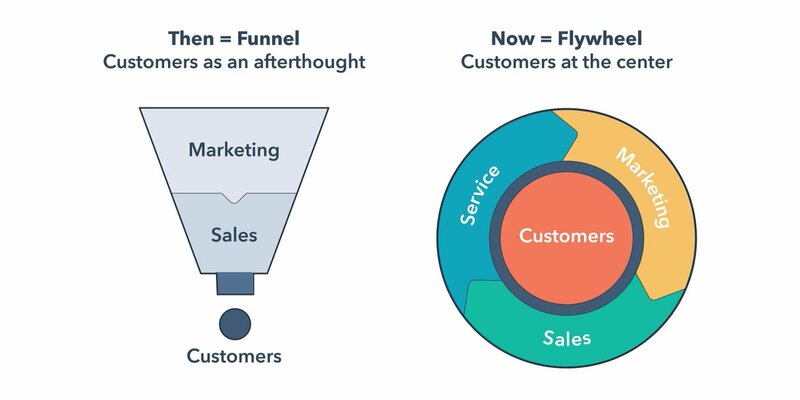 HubSpot's funnels also reflected the correct belief that at the start of your journey - "Attract" - there will be lots of opportunities and as you try to build relationships, "Convert", you will see less and less opportunities. It wasn't wrong, it just didn't exactly put the customer at the heart of everyone's hard work, which we all know they should be. For HubSpot to recognise this and come up with a much stronger solution really is indicative of their continuing strive to offer best-fit solutions and approaches for all clients. In announcing the shift from linear to circular, they've put real focus on customers, ensuring they truly are at the centre of everything - allowing businesses to develop their strategies and services around the customer, not as a way of pushing their way into the customer's space. What should the flywheel approach mean to you? Let's just say it, from a slightly selfish point of view... As a Silver HubSpot Partner Agency, this is a really exciting time to be a part of the HubSpot journey. But also, it makes the inbound journey really exciting for our current and future HubSpot clients. HubSpot's shift in methodology means we're focusing more on you and in return, you will focus your efforts better for your customers - win/win. Also, as part of INBOUND18 - the huge inbound marketing conference HubSpot holds in Boston, US, every September - HubSpot revealed new product packages that are much more exciting and comprehensive for customers. The particularly exciting new option is the Growth Suite, even at Starter level, sitting at an incredibly affordable price (particularly if you take advantage ASAP) considering it includes tools for marketing, sales and customer service. North East SMEs have never had a more exciting opportunity to engage with HubSpot's tools, but most importantly, reinvigorate their marketing strategy with an inbound approach that promises to keep consistently delivering, just like the flywheel always has.